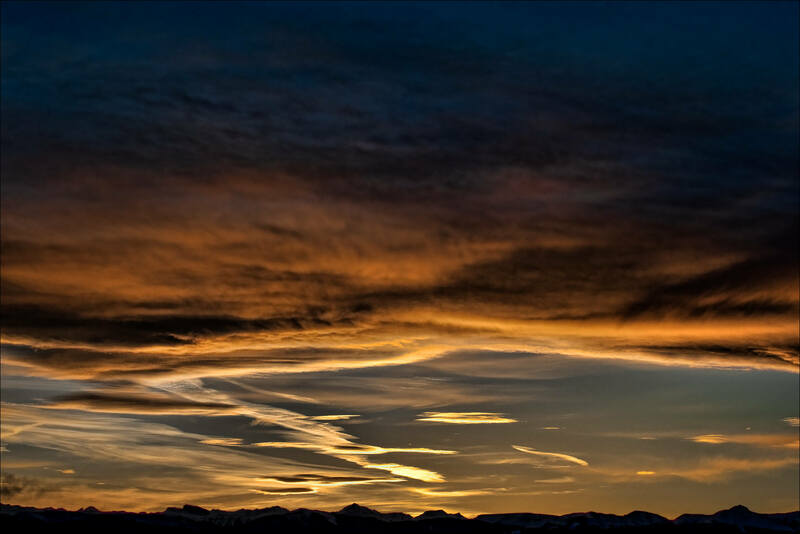 Sunset along the Rocky Mountains when looking west is often worthy of enjoying when possible. I was able to watch this interesting sky develop a few days ago as the daylight slipped away. Here the sun just slipped behind the ridges of the mountains of eastern Kananaskis. I underexposed this scene to avoid burnt out highights near the sun. I like the resulting detail in the clouds and the golden hue of the image. Eight minutes later, I captured a larger scene of the sunset. 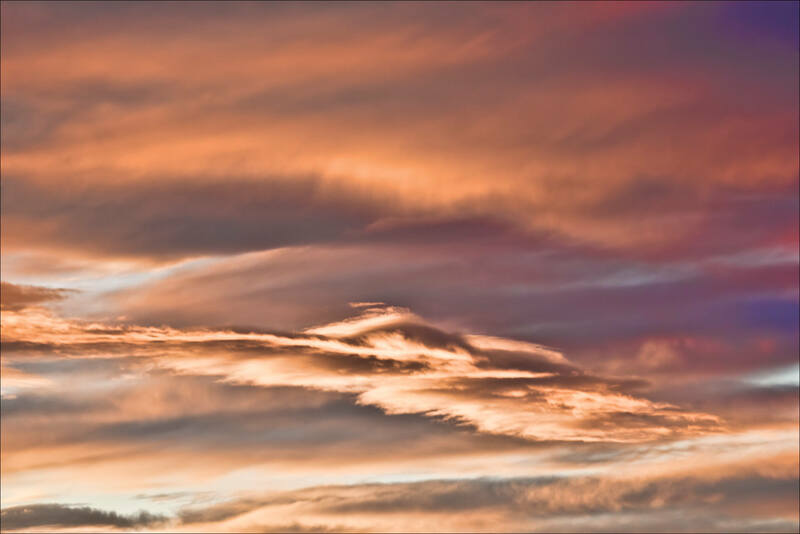 The cotton candy texture and beautiful colour in the upper clouds steal the scene in the image below. One of the last photographs I made was well above the mountains. Here I did not underexpose yielding a brighter scene. This has a heavenly feel to it that I find interesting. This entry was posted on February 18, 2011 by Christopher Martin. 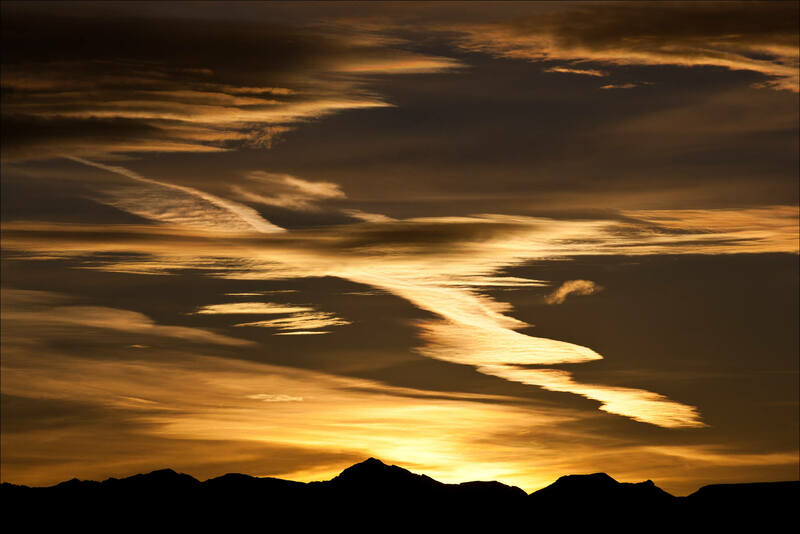 It was filed under Kananaskis, Landscapes, Sunset, Weather and was tagged with alberta, Canadian Rocky Mountains, clouds, golden sunset, Kananaskis, landscape, photography, silhouette, sky, sunset. Gorgeous. I too am fascinated with the different colors and textures of the sky. No two are alike. I love your photographs; they are quite inspirational. Wow these are just fantastic skies!!! You got a beautiful light there, and the settings are perfect to capture it! Whenever there is a break in the clouds at sunset, these mountains often serve up something special. I usually forget about the frozen fingers and my windburned face until I snap out of the trance when I finally get back inside. Well worth it either way. Oooff. It’s fantastic. All of them. I love how the sky looks like spun gold… lovely. Beautiful! Thank you for explaining your creative exposure decisions.